Dr. Marcelina Carpizo, giving inputs. 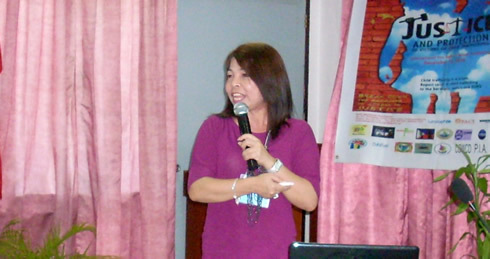 Ms. Sheila Grace Formento, Training Officer, National Secretariat of the Philippines Against Child Trafficking (PACT), commended the PACT-Zamboanga City Chapter (PACT-ZCC) for its vigorous campaign against child trafficking which has resulted in convictions of traffickers, rehabilitation and reintegration of victims, and the rescue of would-be victims. The latest of these success stories was the rescue of some 82 women at the Zamboanga International Airport which recently grabbed the headlines of local newspapers. Coming from various parts of the country, including Luzon and the Visayas, the would-be victims were allegedly promised high-paying jobs abroad. Formento made this commendation after listening to reports of local stakeholders during a dinner-meeting held on April 13 at a local restaurant. Presiding the meeting was Dr. Marcelina Carpizo, director, Western Mindanao State University Center for Peace and Development (WMSU-CPD) and chairperson, PACT National Campaign Council. In attendance were some of the officers and members of the PACT-ZCC coming from both the government and the Department of Social Work and Development (DSWD) Regional Office, the Philippine National Police Women and Children’s Protection Desk (PNP-WCPD), CAPIN and WMSU-CPD. Meanwhile, Mr. Bernardo Mondragon, member, PACT National Campaign Council, hailed PACT-ZCC’s strong network of government and private stakeholders, which according to him, is vital in addressing the gargantuan task of fighting a crime as organized as human trafficking. Ms. Formento and Mr. Mondragon, together with Ms. Nancy Trani, Administrative and Finance Officer, PACT National Secretariat, were in the city to conduct a Community Educators’ Training on Anti-Child Trafficking which was held on April 11 to 13 at the Zamboanga State College of Marine Sciences and Technology. They were joined by local facilitators, Dr. Carpizo and Mr. Kit Berik, Technical Assistant, WMSU-CPD and PACT-ZCC member. Some 25 stakeholders from Tawi-Tawi, coming from the following government agencies attended the seminar: Provincial Government of Tawi-Tawi, Municipal Social Work and Development Office of various municipalities; the Philippine National Police; the Philippine Coast Guard; the Integrated Provincial Health Office; and the Department of Education. The Child Fund, an NGO advocating children’s rights also sent a participant. A practicum capped the training on the last day during which participants were divided into groups and fielded to select barangays in the city. They simultaneously conducted an anti-child trafficking orientation among barangay folks. Meanwhile, Regional Director Teodulo Romo of the Department of Social Work and Development in Region IX (DSWD IX), underscored the vital role of stakeholders in Tawi-Tawi in the anti-child trafficking campaign nationwide, being a transit point for the trade. He gave the keynote address during the training’s opening program. Romo likewise challenged the participants to make Tawi-Tawi child trafficking free. He urged them to establish a Municipal Inter-Agency Council Against Child Trafficking in towns where there are none yet, and to activate existing ones. He expects the stakeholders to conduct trainings to raise the awareness of their people about this heinous crime and empower them to fight it. Romo tried to put a human face on child trafficking. He related the travails of victims who are forced into prostitution; hard labor under harsh and risky conditions;s and removal of some vital organs against their will.